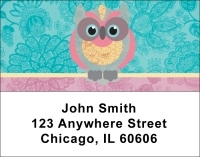 The almost infinite variety of bird life offers rich choices for those looking for address labels with birds that reflects their personal interests. 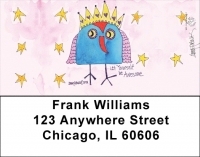 And colorful is the germane adjective when it comes to this selection of bird mailing labels. From tiny hummingbirds to majestic eagles, each choice will appeal to a certain class of bird-admirer. And an Audubon set offers a variety of the most popular avian friends - goldfinch, cardinal, bluebird and woodpecker. 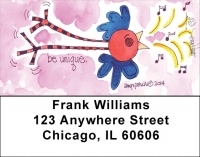 The popular art duo of Challis and Roos decorates labels with whimsical owls, while those traditional live-in favorites, cockatiels and parrots, have their own labels. The problem is settling on just the one (among more than 60) you choose to represent your tastes.